International departure taxes of $125 plus current fuel surcharges of $320 are included (subject to change). Today our pilgrimage begins! We depart the USA for Paris, on our transatlantic flight aboard a wide-bodied jet. We enjoy in-flight movies, dinner and breakfast aloft. This morning we arrive in Paris and are greeted by our Unitours guide who will remain with us for the duration of our pilgrimage. We drive into the Illuminated City, Paris. Our first stop is Sacré Coeur, located at the summit of Montmartre, the highest point in Paris. The spectacular view of the city will take our breath away. We celebrate Mass at Saint-Pierre de Montmartre church, founded by St. Denis. After free time for lunch on our own, we enjoy a driving tour of Paris, passing the Eiffel Tower, the Arc de Triomphe and down the famous Champs-Elysees. Our last stop today is the famous Notre Dame cathedral, the most enduring symbol of the French capital, on the Ile de la Cité. Time permitting, we continue to Sainte-Chapelle, the royal chapel, constructed in a Gothic style. Dinner and overnight at our hotel in Paris. After breakfast, we journey to Lisieux, where St. Therese, known as “The Little Flower” lived. Born in 1873, her autobiography The Story of a Soul was discovered in 1899. At the age of 15 she joined the Carmelites at Lisieux. Canonized on 17 May 1925, her extraordinary love of God and service to humanity come alive as we visit the Cathedral Basilica of St Peter, and Les Buissonnets, her family home, where we pay homage to her parents who were both recently canonized. This afternoon we visit the statue of the Virgin Mary that smiled at St Therese during a spiritual ecstasy before curing her illness. We pray in the Carmel Chapel where St Therese prayed just before her death in 1897. Our afternoon concludes with a visit to the Basilica of St. Therese, where we celebrate Mass. We return to Paris for dinner and overnight at our hotel. After an early breakfast at our hotel, we celebrate Mass at the chapel of Our Lady of the Miraculous Medal on the Rue de Bac, where Mary appeared to St. Catherine Laboure and gave her instructions to make the Miraculous Medal. The shrine contains the incorrupt body of St. Catherine. The Blessed Mother also appeared to a “Daughters of Charity” Sister and gave her instructions to make the Green Scapular. We walk around the corner to the Shrine of St. Vincent de Paul, at the Church of St. Lazare. St. Vincent de Paul’s tomb is here. He was a shining example of love for the poor. We depart Paris and head to Chartres, after free time for lunch on our own, we continue with an in-depth guided tour of Chartres. The town is a former pagan sanctuary that was evangelized in the fourth century and became a pilgrimage site in 876. In this year, Charles the Bald gave the town the tunic, tradition says, worn by the Virgin Mary while giving birth to Jesus. The 13th century cathedral dominates this idyllic town, surrounded by wheat fields. The church building itself is literally a Bible in stone. It contains over 4,000 sculpted figures and 5,000 figures in the stained-glass windows, illustrating the Bible and lives of the saints. Dinner and overnight in our hotel south of Chartres. This morning we continue to Nevers to visit the convent of St. Gildard, where Bernadette Soubirous of Lourdes spent the final 13 years of her life. Here we see the incorrupt body of Saint Bernadette kept in a glass reliquary. We enjoy a guided tour of Nevers. We continue to Paray le Monial, known as the City of the Eucharist, and visit the site of the Shrine of the Sacred Heart of Jesus and Saint Margaret Mary Alacoque. Here we stop in the Chapel of the Visitation. We continue to Ars, the village of the Holy Cure and visit the house and shrine of St. John Vianney, the patron saint of all priests. We enjoy a guided tour of Ars and view the shrine of St. John Vianney, where we celebrate Mass. We also stop at the famous statue on the outskirts of the city. Dinner and overnight at our hotel near Ars. After breakfast, we depart Ars traveling along the Rhone River to the Shrine of Lourdes. Upon arrival we celebrate Mass at the Grotto and join the Candlelight procession. Dinner and overnight Lourdes. 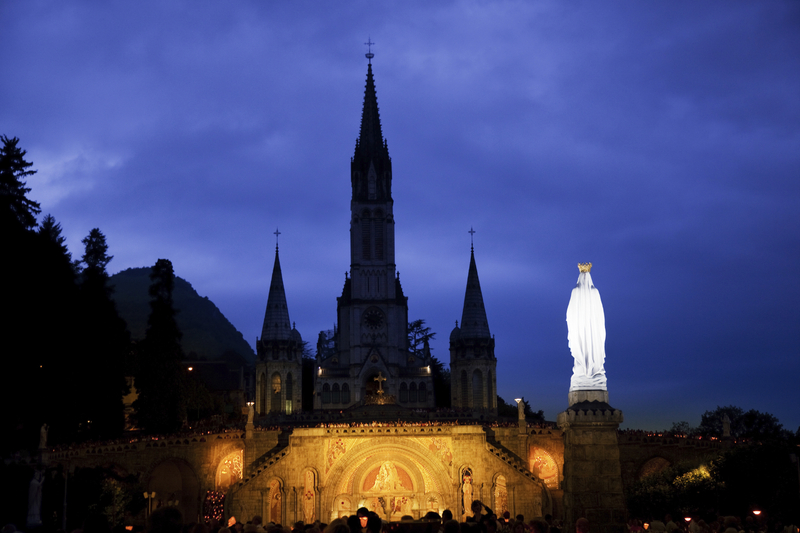 This day is spent in devotion to Our Lady of Lourdes. We enjoy an orientation visit to the Shrine and a walking tour of Lourdes, visiting Boly Mill, where St. Bernadette was born, the Cachot, formerly used as a jail, where she lived during the apparitions, and the parish church. We celebrate Mass and then have free time for private devotions. We join the Eucharistic Procession, the Blessing of the Sick or the legendary. We once again join the Rosary and candlelight procession. Overnight and dinner at our hotel in Lourdes. Today is a free day in Lourdes. We celebrate Mass together and then have the option of walking the Stations of Cross. We can explore the town of Lourdes on foot. We may wish to experience the healing waters of the miraculous Lourdes spring. Tonight, our farewell dinner is in a local restaurant. We join the Rosary and candlelight procession this evening. Overnight at our hotel in Lourdes. This morning our extraordinary pilgrimage concludes as we drive to the airport and board our flight back to the U.S. via Paris arriving later today. Our memories of our spectacular Shrines of France pilgrimage– will stay with us forever.